For background information on London’s famous RT-type buses, click here. This is the chassis of one of nearly 4,700 post-WW2 RT buses built by AEC Ltd between 1947 and 1954. 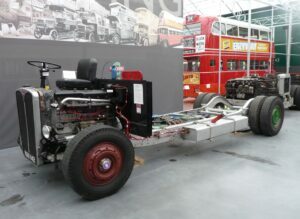 The last bus to sit on this chassis was numbered RT2213 and ran for London Transport until 1969 after which it was sold for further service with the Burwell & District bus company near Cambridge. In the 1970s, the bus was converted to a mobile restaurant and later to a children’s shop. During 1994, while stored awaiting restoration, the bus was set on fire, being almost completely destroyed. The body remains were removed and the chassis was eventually donated to the Museum. Volunteers replaced damaged components and reconditioned other items, including unseizing the engine, bringing the chassis back to working condition. It has since been completely cleaned and repainted and now forms a fully-working demonstration unit, showing the location of the various mechanical components. It also provides an interesting comparison with the other, much cruder and very different, chassis on display – the 1920 K-type.